Have you been injured in a motorcycle accident in Washington? If you were injured due to the fault of another driver, you should call a personal injury attorney right away. A motorcycle accident attorney like Roger Priest can help you take the proper steps to make sure you get taken care of both medically and financially. Motorcycle accident claims can be complicated. A motorcycle injury attorney can take all of the guess work out of the equation. Motorcycle accident claims take time and energy. When you’ve been seriously injured in a motorcycle accident, time and energy is the last thing you can afford. A motorcycle accident law firm can help collect all of your treatment records and deal with the governmental and medical bureaucracy for you. We can help you manage your treatment, bills and records. We can help prepare your personal injury claim. As your personal injury lawyer, Roger Priest can help you make decisions that best protect your injury claims and future recovery. We take motorcycle accident cases throughout Washington State and will travel to you if you are too injured to travel to us. We want to make the process as easy on you as possible. That is why we offer a free consultation and structure our cases so that you don’t pay any attorney fee unless we earn you a recovery on your personal injury claim. Motorcycle accident injury claims can be catastrophic because motorcycles provide much less protection in a crash than a car. 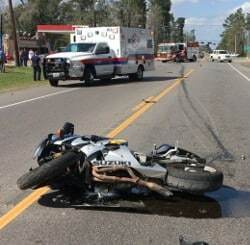 motorcycle crashes can be the basis of a wrongful death claim. If you survive, they can often involve a head injury, a brain injury, a spinal injury, road burns, broken bones and more. Imagine trying to the do the job of being your own lawyer while dealing with such catastrophic injuries. Let us do the heavy lifting and call us today to schedule a free consultation. Because the injuries in a motorcycle crash can be so catastrophic, finding insurance coverage from as many sources can be an important first step in your personal injury claim. Understanding the various types of coverage can help you secure medical coverage early so you don’t have to worry about medical bills and creditors while focusing on your recovery. Each of these coverage types work together to coverage your injury claim while you recover both before and during your injury claim against the at fault party. Personal Injury Protection Coverage. PIP coverage is an type of coverage you may have in your own motorcycle insurance. It offers no-fault benefits for medical and hospital benefits incurred within the first year of your motorcycle crash. It is available to you immediately after the crash. PIP coverage must cover up to $10,000 in medical expenses for each person injured in the motorcycle accident. It will also cover up to $200 per week in lost wages. It must cover at least $2,000 in funeral expenses. It also covers up to $5,000 for payment to others for work you cannot do for yourself, like housekeeping and yard maintenance. Because it is no-fault and immediately available, PIP coverage is a great option for securing coverage of medical bills in both small cases and early on in catastrophic injury cases. Underinsured Motorist Coverage. UIM coverage is another form of first party coverage available to you from your own insurance company. Where you are injured beyond what the policy limits of the at-fault driver allow, your own UIM coverage can offer you more money. You can only seek UIM coverage if you were you were injured by the fault of the other driver, unlike PIP coverage. Liability Coverage. This coverage is what we generally think of when we sue an at-fault driver. Liability coverage is third-party coverage, meaning it is bought by another person to protect them financially when you sue them for negligence. Bodily injury coverage minimum requirements in Washington require coverage for at least $25,000 per person and $50,000 per accident. That means the at-insurance company may not be able to offer you more than $25,000 for your accident and you would need to fall back on other coverage to make you whole (or as close thereto). A motorcycle injury lawyer, like Roger Priest, can walk you through the process and help you secure financial compensation sufficient to take care of your present and future medical issues, plus help you recover for your pain and suffering as well. Call a motorcycle lawyer today to discuss how we can help.